It’s been snowing all day here in Madison. My daffodils and hyacinth are covered in glistening chunks of ice. There’s almost nothing good about winter weather in spring, except for the fact that it gives me an excuse to make just a few more hearty meals before turning to lighter, springtime fare. 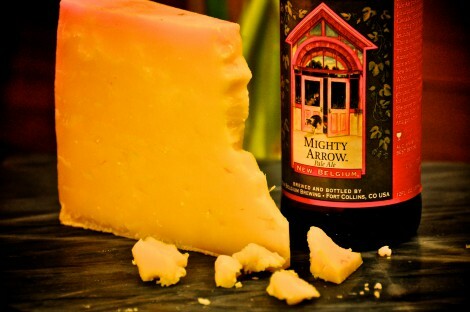 And nothing says hearty like beer and cheese. As part of the Foodbuzz Tastemaker Program, I received a stipend from New Belgium Brewery to purchase their beer and create a recipe with it. Since I can’t drink beer these days (I’m 28 weeks pregnant), the next best thing is to cook with it. Most of the alcohol cooks off, right? For my recipe, I chose to make a Beer and Cheddar Soup, in honor of my Wisconsin roots. I had fun geeking out at Fromagination cheese shop, tasting several different cheeses before choosing a local, 16-month bandaged cheddar from Bleu Mont Dairy. 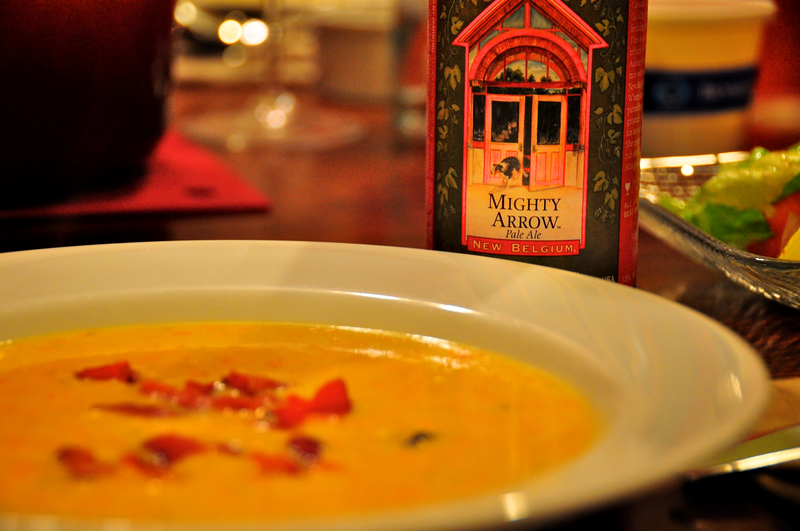 For the beer, I chose Mighty Arrow both because I love pale ales and because I figured it was flavorful enough to stand up to the cheese, but not so strong as to overpower the soup. Wash the leek in a bowl of cold water, separating the layers to remove any sand or dirt. Drain and dry before dicing. Cook the diced leeks, carrots, celery, garlic, and bay leaf in butter in a heavy, 6 or 8 quart saucepan or dutch oven over moderate heat, stirring occasionally, until vegetables begin to soften, about 5 minutes. Reduce heat to medium low and sprinkle flour over the vegetables. Cook, stirring occasionally, about 3 minutes. Add milk, broth, and beer in a stream, whisking, then simmer, whisking occasionally, 5 minutes. Stir in mustard, salt, crushed red pepper, and black pepper. Add cheese by handfuls, stirring constantly, and cook until cheese is melted, 3 to 4 minutes (do not allow the soup to boil). Discard bay leaf. Serve sprinkled with the crumbled bacon, and enjoy with some fresh, crusty bread. Yummm!!! That looks so delicious! Sadly it is also cold here in Philly. But this soup may be just the thing to warm up my day. I love me some melted cheese … and with beer added, well what could get much better than that?